Below is the list of selections for this week (JUL – 3 Weeks to Expiration). It is trading a bit higher now than it was back then and the market is a bit shakier so this isn’t quite the ‘no-brainer’ trade that it was back in March. However, I still think this is a relatively low risk trade. The $95 strike is below recent support. In addition, if LO does fall and you find yourself owning it at $95 you will own a 250-year old company with a 5.5% dividend yield. Best of luck to all this week. PS. IDCC, which appeared on our list last week still looks good. The JUL puts have a PF > 2.0 at all strikes between $30-$33. Regular readers will recall that last month I executed a NP trade on Petroleo Brasileiro S.A. (PBR). My trade involved selling 3 JUN $32 put for $0.65. These puts finished OTM at expiration this past weekend. A brief primer on PBR. PBR primarily engages in oil and natural gas exploration and production, refining, trade, and transportation businesses. It is headquartered in Brazil and is in fact majority owned by the government of Brazil. It has a market cap of $210B and has the stated goal of becoming the largest integrated oil and gas company in the world. I like PBR at these prices. It is trading at two-year lows and has a Price/Book value of 1.08. Recent price weakness appears to be caused by two factors. First, the price of oil has been declining for the past several weeks. West Texas Intermediate has fallen from $103 to $93 in less than a month. Second, there is an overhang of uncertainty regarding the amount of capital required to fund PBR’s next 5-year plan. Some analysts and investors are worried funding the plan may require a secondary offering of stock, thereby diluting existing shareholders. As I mentioned above I am comfortable owning PBR at these prices. Yes, it could still fall significantly if we experience another market crash like 2008-2009. However, I am certain that in the long run oil demand (and consequently price) are headed in one direction; up! Thus, while I might have to sit on a paper loss for a period of time, I am confident PBR will recover and go on to hit new highs at some point in the future. For all these reasons I decided to enter a new PBR trade. Today, I sold 3 JUL $31 puts at $0.55. My ROIC, net of commissions, is 1.67%. With 25 DTE my annualized return will be 24.37%. Well, I’m back with the selections this week for our Deep OTM NP Strategy. I’m going to keep this short and to the point. 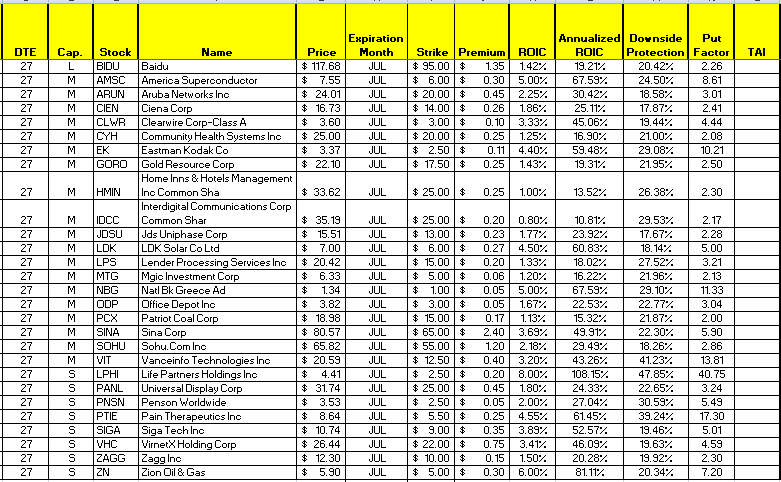 While I’m going to post the list of selections; in my opinion, NONE are worth the risk in this market. My suggestion is to keep your capital safe and in reserve such that you can take advantage of better opportunities which may arise in the next few weeks. I need to give you an update on my trading activities these past few weeks. I’ve not been very good at posting my trades at anywhere near ‘real-time’ Let’s look at them in alphabetical order. First up is CSCO. Back on June 8 my JUN $18 puts were assigned early and I had 500 shares of CSCO put to me at $18. My intent had been to roll these out two or three months in the week before expiration but somebody beat me to the punch and dumped the shares to me at $18. I continue to hold another 5 contracts of CSCO puts at the $16 strike price which expire in July. I am not going to let these get put to me early. Should CSCO fail to rally in the next week or so I inted to roll them out to AUG or SEP.
Next up is EXC. Not much to report here. I am still long 200 shares and short 2 JUL $43 calls. On June 10th I received the 2nd quarter dividend in the amount of $105. Now let’s look at GTY. As you know I am currently long 500 shares and previously was short the JUN $25 calls. GTY over the past week or so has bounced around on either side of my strike price. Not wanting to have the stock called away at expiration I decided to buy back my JUN $25 calls and sell the SEP $25 calls. I did this on June 16 for a net credit of $1.10/share. Doing this keeps me in position to qualify for the next dividend of $0.48. The stock goes ex-dividend sometime this coming week. Hugoton (HGT), my oil and natural gas trust is up next. I remain long 500 shares and short the AUG $22.50 calls. HGT has been falling for the past couple of weeks and my calls are now OTM. The only activity in this position was the receipt of my June dividend in the amount of $62.51. Next up is PBR. Back on May 23 I sold 3 JUN PBR puts at the $32 strike price for $0.65. These expired OTM today. This gave me a 1.93% ROIC with a holding period of 26 days. Annualized my return was 27.09%. The last trade I need to update you on is WFR. You’ll recall on May 24 I sold 5 JUN $10 puts at $0.43. At the time WFR was trading at around $10.02. Since then it has continued to fall sharply, closing Friday at $8.46. Not wanting to have the shares put to me early I decided to roll my position out to the OCT expiration. I was able to do so for a net credit of $0.58/share. Well, another month of options have expired. This trading month produced 38 selections. 23 of the 38 (60.5%) trades finished OTM. This is by far the worst ‘win’ percentage since I began tracking this strategy just over a year ago. To have traded all 38 of the selections would have required $282,250.00 in capital. This would have produced premiums totalling $5,572.90 (net of commissions). This results in a ROIC of 1.97%. However, once again this month our premiums would have been gobbled up by losses. Left unmanaged (i.e., not exiting the position at the first sign of trouble) would have produced total capital losses $15,731.25. Again, I want to highly recommend you do significant DD on any selection you choose to trade. As you can see from the above results, when the overall market is in a downtrend and volatility is increasing the ‘win’ percentage can drop significantly and the capital losses can be substantial. Look for another post with the first round of picks for JUL expiration. It’s been a busy week at my house. My oldest son graduated from high school yesterday. Thus, the week was filled with preparations for the obligatory ‘open house’ and arrival of out-of-town relatives, some of which are still here. Thus, my investment analysis and subsequent write-up in this post will be short and to the point. Here are the trades that met our selection criteria for this last week before JUNE expiration. None of these selections peaked my interest. None are ones I’d be willing to hold should they fall and expire ITM. Given the current market conditions that is a critical consideration. Several selections from earlier this month also passed our Week 1 screener. RIMM is one. It closed Friday at $36.56. For the week it was down $2.42 (6.21%). Both the JUN $32.50 and $30 strikes meet our JUN Week 1 criteria. The puts closed Friday $0.46 and $0.16 respectively. With the $32.50 strike you get 12.36% DSP. This trade yields 1.4% ROIC with one week to expiration and has a PF of 5.3. The $30 strike has 18.38% DSP, a 0.53% ROIC, and a PF of 3.5. Another selection from earlier this month which reappeared this week is IDCC. It closed Friday at $35.91, down $1.97 (5.2%) for the week. The $32 strike at $0.30 has 11.72% DSP with a ROIC of 0.94%. Well, that’s it for this week for our Deep OTM NP Strategy. If time allows I’ll be back later in the day with another post updating my CSCO NP trade. Wow, this week went by fast. Just seems like yesterday I was writing about JUN Week 3 selections. Anyway, let’s dig into the selections for this week. I found one or two that are pretty interesting. My two favorites this week are appropriately at the top of the list displayed above. Let’s first take a look at BVN. If this is a symbol that’s not familiar to you there’s a reason. It is a foreign stock. The name of the company is Compania Mina Buenaventura, S.A. It is a mining company headquartered in Lima, Peru. It was founded in 1953. It has a market-cap of $10.6B. Here is a price chart for BVN. I believe this stock appeared on our list this week because of the upcoming presidential election in Peru on Sunday, June 5. The election pitts a pro-business candidate against a socialist (hmmm…sounds familiar). Anyway, it is a very close race. I’m speculating that because stock markets hate uncertainty the options on this stock are elevated. If the pro-business candidate wins the stock will likely recover some lost ground. If the socialist candidate wins the stock could continue to fall. Traders who are willing to bet the pro-business candidate will win or that the stock won’t fall sharply if the socialist wins will be well compensated for the risk they are taking on. The bid on the JUN $37 put closed Friday at $0.75 which generates a ROIC of just over 2% with just 14 days to expiration. There is also over 13% of DSP. However, I have to point out that since the election is tomorrow before the market opens on Monday it is certainly possible the premium may disappear before the opening bell if the pro-business candidate is announced as the winner. Next up on our selection list this week is RIMM. Research in Motion is the manufacturer of mobile computing and telecommunications devices. Until the Apple iPhone came on the scene RIMM had a virtual lock on the corprate mobile telecom market. RIMM is another foreign stock. It is headquartered in Waterloo, Ontario Canada. Generally I like to analyze and show the one-year chart for a stock I’m considering. However, with RIMM this time I want to show you the 5-year chart. The reason I selected the 5-year chart is because I want to show you just how cheap this stock is relative to price over the past 5 years. You have to go back to the financial crisis in 2009 to find RIMM trading at this level. To find RIMM trading at the the $32.50 strike price of the selected put you would have to go all the way back to September of 2006. Ordinarily I would not try to catch a ‘falling knife’ stock like RIMM. However, in this case I may be willing to make an exception. Why? Because I believe it is oversold and due for a bounce. It closed Friday at $38.96. This is over 17% above the $32.50 strike price. Also, I wouldn’t mind owning RIMM at $32.50. At $32.50 RIMM would be trading at around 5x earnings. That’s cheap! Talk about hated. RIMM also has over $2B in cash on its balance sheet and zero debt. Thus, it is not going to go out of business anytime soon. Everyone seems to think RIMM is going to end up like NOK; ultimately losing the battle for business customer dominance in the mobile phone space to Apple with its iPhone or Google with the Android operating system. I don’t think so. Thus, I’m willing to place this bet and ultimately own RIMM at $32.50 if I have it put to me. Well, that’s it for this week. Best of luck in your trades. It’s getting more volatile out there so be careful. Be very careful in minding your stop loss positions or better yet only trading options on those stocks you truly wouldn’t mind owning.